On Wednesday, 9th April, the day which marked the 80th anniversary of the capture of Vimy Ridge by the Canadian Army Corps, I was lucky enough to be at the Memorial to take part in the commemorations there. Before many hundreds of distinguished guests, the achievement of the Canadians, fighting in their first All-Canadian action, were honoured and remembered. In the natural amphitheatre around the twin pylons of the Memorial, many thousands of people sat and stood in the hot sunshine to Remember, among them three veterans who had been present on the ridge 80 years before - the oldest of them 108 years old. Honouring the Remembrance of the Fallen and the Missing from those days were units of the Canadian Army, a band from the Canadian Artillery, a detachment of French infantry with their band, distinguished guests and speakers. The heat was really quite intense, and too much for some of the soldiers, who collapsed in the heat. They were quickly revived and taken away to recover in an ambulance parked nearby. Behind the ranks of soldiers and the grandstand facing the Memorial, the Douai Plain stretched away, the coal-tips looking like hazy pyramids in the distance. It was all so spectacular, and warm on this April 9th. The veterans must have suffered on this day as they did 80 years before, from the effects of the weather, but not because of the sunshine and the heat. April 9th 1917 had been a day of rain, sleet, cold, suffering and hardship. There were no bands to greet them then. And there was no Memorial. The Memorial's two towering pylons and twice life-sized figures are built and carved from limestone brought from a quarry in Yugoslavia. It took eleven years to build the memorial and carve the figures in situ, individual "studios" being constructed around the stone blocks which were to form each group. 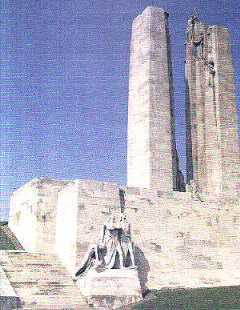 The Memorial's designer was the Canadian sculptor and architect, Walter Seymour Allward. Standing on Hill 145, the highest point of the the 14 kilometre-long Vimy Ridge, the Memorial overlooks the battlefield to the West, still pock-marked by countless shell-holes and mine-craters. The battlefield is still a dangerous place, and there are many signs warning visitors not to stray from the marked paths - there is still a very real danger from unexploded munitions under the ground. It was at Vimy, in 1917, that all four Divisions of the Canadian Corps attacked simultaneously for the first (and last) time, about 100,000 men taking part in the battle. Vimy Ridge was an important part of the Germans' defences, barring the way to the mines and factories in the Douai plain which had been of great use to them in their continuation of the war. The very nature of the Ridge gave it strong, built-in defence, but these natural defences had been supplemented by strong-points, elaborate trench-systems and underground tunnels linking natural caves. All previous Allied attempts to capture the Ridge had failed, and there was a strong body of opinion among the Allied commanders that the Ridge was possibly impregnable and incapable of ever being taken by a direct attack. The Infantry attack was preceded by a powerful artillery bombardment which lasted almost three weeks, involving about 1,000 guns, including huge, 15-inch howitzers. For the first two weeks, some guns were not fired at all, so that the Germans would not be able to locate their positions but eventually, these guns joined in the bombardment, too. Although the shelling was aimed at the German trenches and defensive positions on the Ridge, the Canadians also shelled enemy batteries. They had become adept at locating German gun-positions and had identified the positions of 80 per cent of them. April 9th., 1917 - Easter Monday - dawned cold, with freezing rain and sleet. The ground conditions were very bad, with slippery mud waiting for hamper the Canadians as they began their assault. Heavily laden, the men began to cross the shattered No-Man's Land, skirting as best they could the shell-holes and craters, until they came to the muddy, slippery slopes of the Ridge itself. They advanced behind a creeping barrage - a curtain of falling shells which crept forward just ahead of them. At key places in the advance, fresh troops took over the lead, until by the middle of the afternoon, three of the Canadian divisions had captured most of Vimy Ridge. By the next day, Hill 145 was also in Canadian hands, leaving just a few isolated outposts. By April 12th these, too had been taken and the Canadians' victory was complete. After three years, the Germans were now driven from Vimy Ridge. There was to be no breakthrough, however, as the Canadians were unable to get their artillery out of their positions and across the muddy, shell-torn ground of the battlefield. However, they had captured more ground, more prisoners and more guns than any previous "British "offensive in the war thus far. It was the greatest Allied Victory yet. Although the victory at Vimy came quickly, it did not come without cost. Of the 10,602 Canadian casualties, there were 3,598 dead. This is a high and tragic number, but it must be compared with the 200,000 Canadian, British, French and German dead who lie buried on the ridge from earlier, unsuccessful attacks. And the Canadians alone lost 24,000 killed or wounded on the Somme the previous year. "It was Canada from the Atlantic to the Pacific on parade. I thought then that in those few minutes I witnessed the birth of a nation."